Norwegian Lundehund Characteristics: The lively and happy-go-lucky Norwegian Lundehund is a breed of small dog classified as a member of the Non-Sporting Dog Group (Spitz type). The Norwegian Lundehund, is characterized by its compact, hardy, energetic appearance with an alert, friendly expression with a distinctive spitz-type, richly plumed tail that curls up and over its back. Other characteristics include yellow to brown, medium sized, almond-shaped, slightly slanting eyes; erect, triangular shaped ears and a light, fluid gait. The temperament of the Norwegian Lundehund can be described as Energetic, Agile, Protective. The coat type of the Norwegian Lundehund is described as dense, weatherproof coat in assorted colors. Due to its characteristics and qualities, the Norwegian Lundehund demonstrated the desired traits of a Watch dog, Hunting dog (Spitz type) and is known by its nick name the "Puffin Retriever". The origin of the Norwegian Lundehund dog breed was in Norway where it was developed in the Ancient Times. Norwegian Lundehund Breed Group and Dog Type - Non-Sporting Dog Group (Spitz type): The Norwegian Lundehund is one of the many breeds of dogs that belong to the Non-Sporting Dog Group (Spitz type). Other names for the Norwegian Lundehund: The Norwegian Lundehund is known by the nickname of the "Puffin Retriever". Other names for this breed of dog include the Lundie, Lundehund, Norwegian Puffin Dog and Norsk Lundehund. Origin of the name: The origin of the name "Norwegian Lundehund" derives from its country of origin, in Norway. The word "Lunde" translates from Norwegian as 'puffin' and the word "hund" simply means 'dog'. Norwegian Lundehund History and Origin: The Norwegian Lundehund originated in the Lofoten Islands off the northwest coast of Norway during the prehistoric times. 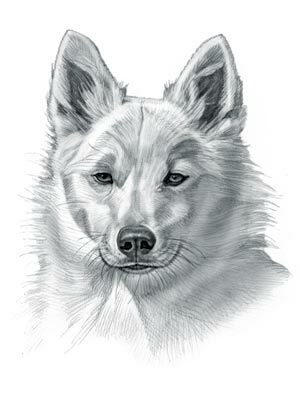 The ancestors of the Norwegian Lundehund breed were the ancient spitz-type dogs, known as the Asian or Nordic breeds, wolf-like types of dogs that shared a similar heritage and ancestry. The Norwegian Lundehund inherited some of the attributes and characteristics of the Spitz types of dogs such as pointed ears, curly tail and a pointed muzzle. Norwegian Lundehund History - The Puffin Hunter: The agile and intelligent Norwegian Buhund was used by the Norwegians help them in puffin hunts. The puffin is a North Atlantic seabird that is characterized by its black-and-white plumage and a large head and a massive, brightly colored bill during the breeding season. The Norwegian Lundehund acted as a special type of retriever. This athletic dog was able to splay its forelegs out sideways and it developed six fully developed toes on each foot, enabling the dog to grip whilst climbing. These special attributes enabled the Norwegian Lundehund to hunt for puffins. Puffins nested in rock crevices and in holes among stones and colonies of the birds bred on the precarious, steep cliffs of Norway. The Norwegian Lundehund was able to reach these nests. The Norwegian Lundehund dog was also able to tilt its head 180 degrees backwards over its shoulder and had ear flaps that folded over, sealing the ear canals, which allowed the dogs to dive deep into the water to retrieve birds. Norwegian Lundehund Modern History: The modern history of the Norwegian Lundehund moved on and the breed is now used as a family pet and companion. The Norwegian Lundehund was officially recognized by the American Kennel Club (AKC) in 2011. Norwegian Lundehund Height: The Norwegian Lundehund breed is classified as a small sized dog. The height to the shoulder of a male dog is 13-15 inches (33-38 cm). The height to the shoulder of a female dog is 12-14 inches (30-36 cm). Norwegian Lundehund Weight: The weight of this small sized dog, in a male dog is 13-20 lbs (6-9 kg). The weight of the smaller female dog is 13-20 lbs (6-9 kg). Norwegian Lundehund Coat Type: The coat type is described as dense, weatherproof coat. Norwegian Lundehund Grooming - MODERATE Grooming Needs: The grooming needs of the Norwegian Lundehund is categorized as Moderate in order to maintain a healthy, tangle-free coat and reduce the risk of skin infections. The modest grooming needs of the Norwegian Lundehund is considered to be mid-maintenance requiring weekly brushing and combing. Grooming Requirements should include bathing the dog on a monthly basis and making regular inspections of the nails, teeth, eyes and ears. Norwegian Lundehund Litter Size: The litter size of this dog breed ranges from 5 to 8 puppies. Norwegian Lundehund puppies for sale can be obtained reputable breeders and from rescue centers. The cost of Norwegian Lundehund puppies varies depending on location, pedigree history and the dog breeder. Norwegian Lundehund Temperament and personality: The temperament and personality of this popular dog breed is described as Lively, Energetic, Agile, Protective and Happy-go-lucky. Norwegian Lundehund Exercise Requirements - LOW Exercise Requirements: The exercise requirements of this breed of dog is low to moderate. The Norwegian Lundehund requires regular daily exercise consisting of approximately 30 minutes to one hour every day. This small dog has a light, fluid gait with small strides and only requires a fairly slow speed by the owner to meet the dogs exercise requirements. Remember that it would take a lot of extra steps by your dog to keep up with your normal walking pace. Norwegian Lundehund Diet: A fully grown Norwegian Lundehund should be fed twice a day. A diet consisting of a premium dog food can be balanced with fresh food eaten by the family. The question is What Can Dogs Eat?. Check out our comprehensive list of what dogs can and what dogs cannot eat. Norwegian Lundehund Health Problems: Potential health problems of the Norwegian Lundehund breed include Lundehund syndrome (intestinal disorders). Resolving health problems can prove to be expensive and it is always wise to obtain pet insurance or dog health insurance when buying a dog. Is the Norwegian Lundehund dog breed said to be Hypoallergenic? Answer: No. Norwegian Lundehund Lifespan: The life expectancy of dogs vary according to the size, breed of dog and any serious health problems. The typical lifespan of the Norwegian Lundehund breed is 6 to 8 years. Norwegian Lundehund Male Dog Names: Male Dog names are most often chosen to reflect favorite names of the owner or the strength, size, coloring and country of origin of the Norwegian Lundehund breed. To give you some inspiration regarding good male Norwegian Lundehund names our small selection might be of help with naming boy dogs. Our top male dog names are: Oscar *** Lasse *** Anders *** Sander *** Magnus *** Sindre *** Henrik *** Bastian *** Andreas *** Joakim. Norwegian Lundehund Female Dog Names: Female Dog names tend to be softer, prettier and reflect the temperament of the girl dog. Our top choice of good female Norwegian Lundehund names are Thea *** Hanne *** Marte *** Frida *** Maren *** Lise *** Tiril *** Maud *** Mia *** Wanya.